Marc Chagall was the quintessential alien in exile, saying “My homeland exists only in my exiled soul.” Sombre early Russian works gave way to heady Cubism before settling into a more narrative style. 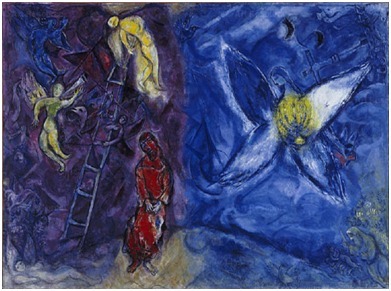 Chagall has a childlike innocence also using significant religious themes to produce powerful and joyous images. Deep blue is the colour of wisdom and dominates much of his work, both in paintings and stained glass.